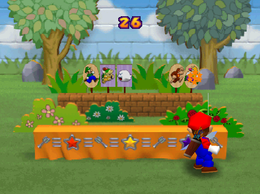 Archer-ival is a 1-vs-3 minigame in Mario Party 2. Its name is a portmanteau of "archer" and "archrival". The main objective for the player with the bow and arrow is to shoot the characters' panels. Once the solo player has removed all three players' pictures before the thirty seconds are over, he or she wins. The solo player can also earn some extra coins by hitting the other pictures thrown in as well. The Boo panel gives one coin, the Toad panel pictures give two coins, and the Baby Bowser panel give three coins. The solo player has unlimited arrows. The three players main objective is to dodge to the arrows shot by the solo character. For them to win, at least one of them need to remain for thirty seconds. Each panel moves at a slow pace, yet it is enough to avoid an arrow being shot directly at it. The non-playable panels and other characters' panels though can block the path, causing them to be a still target for the solo character. In the Mini-Game Coaster, the human player plays against the team of three. Game Rules – "Try to hit the moving targets with your arrows! Knock all three rivals down to win!" Game Rules (Mini-Game Coaster) – "Knock down all three of your rivals in the archery shooting gallery to clear this Mini-Game." Advice – "Hit other targets like Toad, Boo and Baby Bowser to win a cache of coins." Matoate! Shotto!! Hit the targets! Shoot!! This page was last edited on May 29, 2018, at 10:35.